The brainchild of world champion BBQ pitmaster John Wheeler and legendary soul food chef Charles Gabriel, Rack & Soul has quickly entered into the hearts of Columbia University students and Morningside Heights residents. 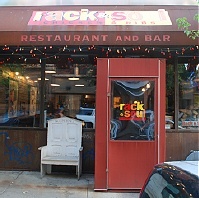 This Upper West Side chicken and ribs joint is located in an area where barbecue joints abound, but soul food lovers agree that Rack & Soul offers the best in southern cuisine in the area. Whether it's Texas-style brisket, baby back ribs, classic fried chicken or spicy Po' Boys, Rack & Soul offers a great variety of southern staples done to perfection. Steer clear of salads and seafood mains to concentrate on what Rack & Soul does best: the barbecue, fried chicken and Po' Boys are the soul of the restaurant. Sides vary from excellent cornbread to standout black-eyed peas, with classic macaroni and cheese as another option. Entrées come with two free sides, so you can try a variety. Both take-out and delivery are available, though customers outside the Upper West Side must pay for the round-trip taxi trip. The only downside to this Upper West Side favorite are the prices, which are a little steep. But for authentic southern cuisine, including pan-fried chicken and apple-wood smoked barbecue, it all seems worth it.